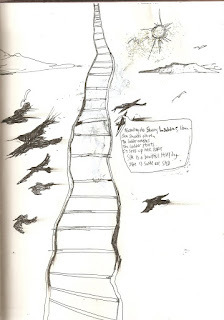 This is an old piece of The Ladder Poem, a long poem in parts I made into a comic. I've often been very frustrated with this comic. It came to me in an overtly religious way (half asleep I envisioned a ladder and a woman speaker conversing for eternity and I wrote the whole thing half asleep in total darkness on the back of other poems without even looking at the page). I did several versions of it, but continued to have trouble arranging it into a book. I never used this image, but I like it, and might do a third version of The Ladder. Speaking of which, this is how Adam Fitzgerald and I got the name for our reading series (The Ladder Poetry Reading Series) and we're having our third reading with Bernadette Mayer and emerging writer Allison Power. I always sell copies of my poetry comics there!